Methods for the reduction of scars and skin blemishes are usually marginally effective, painful, expensive, and often produce further scars during the procedure. The combination of hydroxy acids, abrasion, needling, amd copper peptides often produce surprisingly effective reduction of the appearances of various scars and skin blemishes. This method is low cost, painless, but may take several months to achieve a good cosmetic result. Hydroxy acids, such as salicylic acid and glycolic acid, are widely used as exfoliating agents and for skin peels. They remove dead skin cells and also loosen and slowly dissolve skin lesions such as acne scars, keloid scars, surgical scars, burn scars, moles, skin tags, stretch marks, age spots, and sun damage marks. The secret of hydroxy acid actions is that your healthy, normal skin is very tough and has a high resistance to such acids. In contrast, most skin lesions have less structural integrity and are more easily broken down by the acids. The repeated use of such acids over periods of a month or longer slowly dissolves most skin lesions. 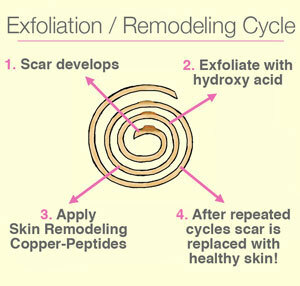 This is essentially a modification of normal skin peel techniques where a very strong hydroxy acid (or other peeling agents such as TCA or phenol) are used as skin peels. Such methods work very well under perfect circumstances. However, hydroxy acids can be highly irritating if the subsequent regenerative response of the skin is inadequate to fully heal the acid-treated skin. If there is too little skin rebuilding, then the peeling agent may cause further scarring or inflammation. The use of Copper-Peptides after hydroxy acids, abrasion, and needling supplies the skin with nutritional copper. Studies on wound healing found that that tissue copper rises during the healing process. But if the level of tissue copper is too low, then healing is impaired and scars remain on the wound. So, by repeated application of a hydroxy acid, you can slowly dissolve away the skin blemish and use Copper-Peptides to aid the skin's functions. This process is repeated once daily or twice daily and an improvement should be noted in a month, but obtaining a cosmetically satisfying result may take several months. Going slow is better than trying to rush the process. Skin can only rebuild so fast. This method can also be used with traditional skin renewal methods such as lasers, deep peels, and dermabrasion. These more vigorous procedures rapidly remove any scar tissue. But subsequent problems arise if the skin fails to heal rapidly. This can produce inflamed, reddish skin for up to a year before healing is complete. In this case, supplying the skin with nutritional copper can facilitate the skin post-procedure recovery. 1. In the morning, wipe your face with a 2 percent salicylic acid pad (available at drugstores). 2. After the salicylic acid pad, apply a copper peptide serum that also contains a small amount of salicylic acid and leave it on. Start with a maximum of four drops daily, and then slowly increase the amount. If you have sensitive skin, start with GHK copper, which is the mildest form. 3. In the evening, apply a light amount of a mix of lactic acid and salicylic acid in a supportive oil-free liquid) and leave it on. 4. 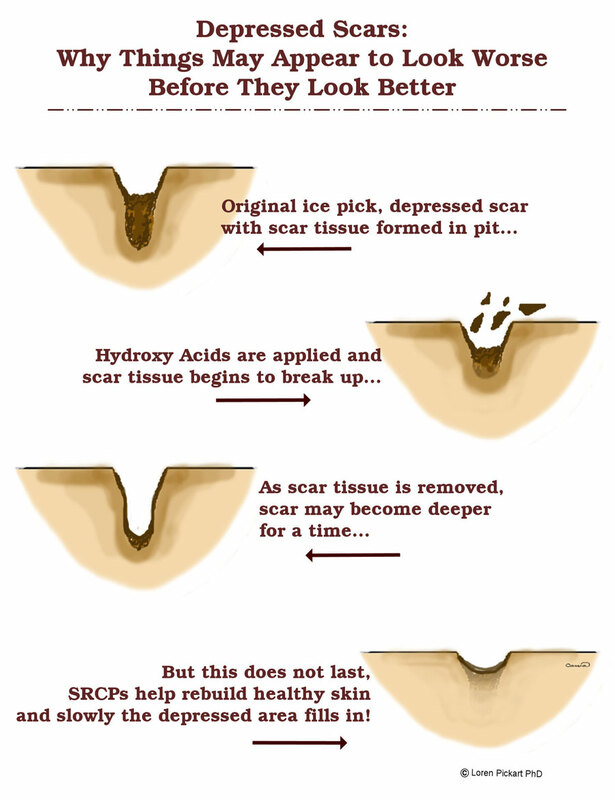 For pitted scars some people use stronger hydroxy acids and/or retinoic acid at night. 5. About every two weeks, use pore-cleansing strips (available at drugstores) on acne-prone areas. Be careful not to overuse the strips to the point of irritation. 6. Some people use this method one day and anti-acne products on alternate days. 7. Anti-acne products can be somewhat drying to the skin. Biological healing oils, such as emu oil, work well as moisturizing agents and rarely increase breakouts. 1. In the morning, apply a copper peptide serum very lightly on the skin tag. 2. In the evening, apply a hydroxy acid (preferably 10% leave-on acid) to the tag. 3. On alternative evenings, you can apply a stronger copper peptide topical cream as a spot treatment on the area. TIP: Sometimes salicylic acid can irritate the skin tag, and it can become reddened. If this happens, you may want to reduce the frequency of application, but try to find a schedule that allows you to keep applying the cream on a regular basis. 1. In the morning, apply a moderate-to-very strong copper peptide cream to the stretch mark. 2. In the evening, apply a hydroxy acid (preferably 10% leave-on acid) to the stretch mark. 3. On alternative evenings, apply another application of the SRCP cream of your choice. 1. In the morning, apply a light amount of a copper peptide serum to the sun-damage mark. If you have sensitive skin, start with GHK copper which is very gentle on sun-damaged skin. 2. In the evening, apply a hydroxy acid cream lightly on the sun-damaged area. 3. On alternative evenings, you may want to apply a moderate-to-very strong copper peptide cream on the area of sun damage. Start with a light application. For the sensitive breast and décolletage area, use a milder copper peptide product designed for this area. 1. If you have oily-to-combination skin, apply a strong copper peptide serum in the morning and a 10% hydroxy acid at night. Start the products lightly, and then slowly increase the amount over time. 2. If you have dry-to-normal skin, use a copper peptide cream with retinol in the morning and a leave-on hydroxy acid at night. 3. 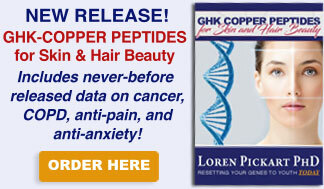 If you are not getting enough effect, try a strong copper peptide product, and use it consistently. 4. If you still are not getting enough of an effect, then slowly work up to a stronger percentage hydroxy acid product. 5. Microdermabrasion sponges or cloths often work well on reducing scar tissue. 6. Daily supplements of 500 mg Vitamin C, 1 gram MSM, 1 gram of Flaxseed Oil, and 500 mg of Borage Oil also help skin rebuilding. 7. 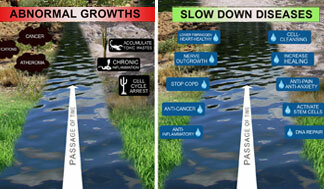 Stress inhibits skin repair and the rate of scar reduction, as it increases blood cortisol. DHEA (75 to 100 mgs daily) may help block the cortisol effect and stimulate skin repair. But only take DHEA for short periods of time, such as one month, if you are experiencing great stress. 8. Regular aerobic exercise increases blood flow into the skin and speeds skin repair and scar reduction. According to recent studies, it also causes the DNA to produce more proteins that are characteristic of young skin, so you get a double benefit—faster healing and younger-looking skin. NOTE: Skin color will usually revert to its pre-damage color. OPTION 1 - Apply copper peptides before using the skin needling device. OPTION 2 - Apply copper peptides very lightly after using the device. 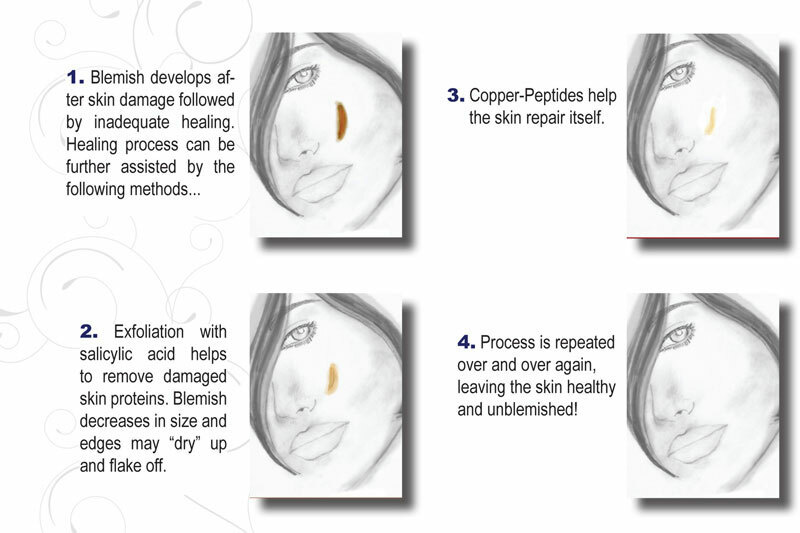 OPTION 3 - Alternate: Use copper peptides on the days you do not use the skin needling device. NOTE: Typically only a mild copper peptide is used along with skin needling devices. Use the method that fits best with your schedule and skin sensitivity. Test on a small area first. The removal or reduction of scars, lesions, and stretch marks from the skin depends on a process called "skin remodeling". The skin is designed to heal wounds quickly to prevent blood loss and infection. 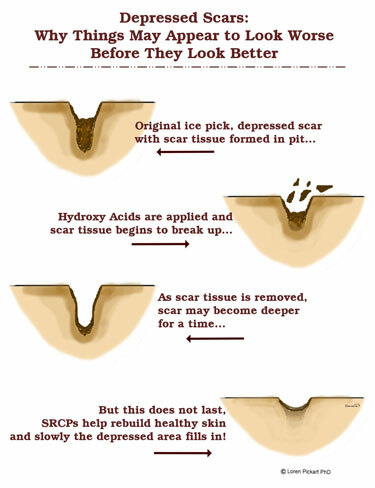 Scars are manufactured from a rapidly formed "collagen glue" that the body deposits into an injured area for protection and strength. In ideal skin healing, the wounded skin is rapidly closed, then the healed area is slowly reconstructed to remove the residual collagen scars and blend the skin area into nearby skin. Scar collagen is removed and replaced with a mixture of skin cells and invisible collagen fibers. This skin remodeling may continue in a skin area for ten years. In children the remodeling rate is high and scars are usually rapidly removed from injured skin areas. But as we reach adulthood, this rate diminishes and small scars may remain for years. One way to accelerate remodeling is to induce a small amount of controlled skin damage with a needle, laser, or other means, and then let the body repair processes rebuild the skin area. Research studies find that adequate tissue copper helps the process of skin remodeling by activating your skin's metalloproteinases that remove damaged proteins (sun as sun-damaged collagen and elastin) and scars. At the same time they help activate your skin's anti-proteases TIMP-1 and TIMP-2 that protect against excessive breakdown of protein. (Simeon et al, Life Sciences, 15, 2257-2265, 2000). They also reduce the skin's protection of the scar-producing factor TGF-beta. Interestingly, retinoic acid (retin-A) is often used for scar reduction but retinoic acid actually increases the production of the scar-producing TGF-beta. (McCormack, Nowak and Koch, Arch Plast Surg 3:28-32, 2001). Animal studies suggest that increased copper also helps to (1) regenerate new collagen and elastin which improve skin firmness and elasticity, (2) increase the production of water holding glycosaminoglycans which is true moisturization, (3) improve the skin’s blood vessel microcirculation, (4) produce biochemical energy from nutrients in the body’s blood supply, (5) increase the natural defense mechanism against oxidative damage, and (6) repair damage to the protective skin barrier. For scientific references on these effects see: Copper-Peptide Regeneration. As the skin is rebuilt and scars removed, the elastic properties of the skin pull it into a smooth surface. A famous dermatologist, the late Dr. Albert Kligman, said that BHAs (in particular salicylic) at concentrations of about 2% are better than AHAs for anti-aging and for skin exfoliation. Professor Kligman is well known in dermatology for his research on the anti-aging actions of retinoic acid (Retin-A). Results from Dr. Kligman's laboratory found that the outermost stratum corneum layer is renewed after applications of salicylic acid. The BHA hydroxy acid loosens the damaged skin proteins and the Copper-Peptides help in the removal of the old, damaged proteins. If you have allergies to salicylates (such as you cannot eat fruit), we recommend you obtain a alpha hydroxy acid (10% and at pH 4 or below). On the other hand, many women say that Lactic Acid, which is naturally on your skin at low levels, is easier on their skin. Lactic acid up to 10% is fairly mild on skin. 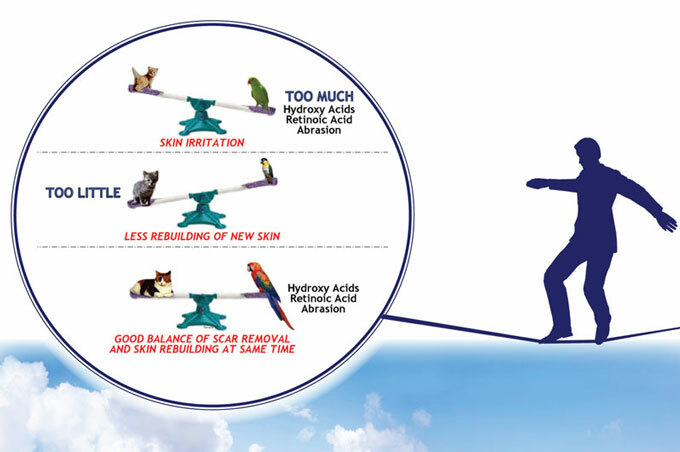 But lactic acids of 30 to 70% are used for skin peels. 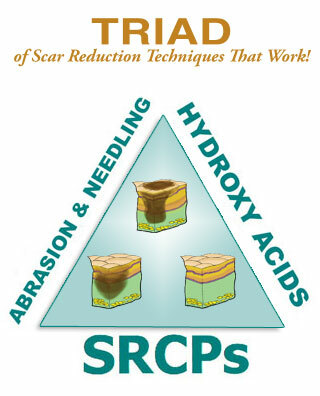 Stronger hydroxy acids will speed the scar reduction process. However, this increases the possibility of irritation or burns. 30% to 70% alpha hydroxy acids are effective but you should use these under the direction of a dermatologist or esthetician. Such stronger hydroxy acids can be obtained from Estheticians and Dermatologists at Spas and Clinics.